State Secretary, Sumter L. Loury, Jr. Please see the charter members for Post 13 listed in the sidebar to the left of page. Captain R. A. Gray was the first commander of the Post . This Post was initially designated the Claude Sauls American Legion Post after Tallahassee citizen Claude L. Sauls who was the first Tallahassee resident to be killed in World War I. Articles of Incorporation, signed by Judge E. C. Love on December 11, 1924, which listed at the time of signing the individuals (sidebar to the right under 1924 Members) as the current members of Post 13. Many of the names listed familiar throughout the 20th Century history of Tallahassee. Buildings, parks and streets throughout Tallahassee and Leon County bear their names. During the time the Post was trying to accumulate funds to build a building, local real estate developer William Anderson considered building a dance pavilion on the north shore of Buhl or Bull Pond (later called Lake Ella) in his Anderson Heights subdivision just north of town. Mr. Anderson had laid the foundation for the dance pavilion, later abandoning the project because he felt “no one would go that far out into the country to dance.” In 1924, William and his wife Alice told the American Legion Post that they could have the land with the dance pavilion foundation on it. The land encompassed lots 1 through 8 in Block “D” of Anderson Heights around the north shore of the lake. The plat map is on page 22 of Plat Book 1of Leon County. In 1923 an electric power dam was started on the Ocklocknee River about 23 miles west of Tallahassee. Guy Winthrop and K. J. Boyd of Winthrop and Boyd Engineering were engineers working on the dam construction. Guy became head of a self-appointed committee consisting of K. J. Boyd, O. J. Nettles, Treo Proctor, Sam Wahnish, George I. Martin, William R. Galt, Bill Cates, Bill Wilson and Miller Walston to see what could be done toward obtaining the necessary materials for a home. Since Winthrop and Boyd were engineers on the dam project, the acquisition committee had the perfect entree to the needed building materials. The story goes that excess lumber and other materials to erect a rough building were delivered via a liberated truck. Past Commander Bill Jacobs says he remembers a relative of his being in this group. He relates that “they saw where the waterline for the new lake was going to be. They went in and cut down the trees before the water rose and covered them.” Construction of the Post Home is thought to have started around 1925 and ended in 1927. The “acquisition committee” and other Legionnaires did all carpentry and other incidental work. What little money there was in the bank was used sparingly for necessities only. William and Alice Anderson formally deeded the property to the Claude L. Sauls Post of the American Legion on June 28, 1930. The transaction is registered on page 517 of Deed Book 21 of Leon County. Initially a large lodge hall with grand brick fireplaces at either end of the hall, the wood frame structure encompasses about 8000 square feet. Over the years rooms have been added at both ends of the building and the outside faced with aluminum siding. The inside, however, remained rough with sideboard sheeting. The interior paneling was finished by using blowtorches to bring up the resin in the heart pine planking. When the resin cooled, the shine on the paneling was gorgeous. It still is. During its regularly scheduled February 28, 1946, meeting, the Post membership passed a resolution to change the name of the Claude L. Sauls Post to the Sauls-Bridges Post 13 of the American Legion to also pay honor to the first Tallahassee citizen to die in the line of duty in World War II. Ben H. Bridges, Jr., was a fighter pilot who died on coastal patrol in California. The name change for the Post was officially filed with Leon County on May 22, 1958. On August 15, 1980, Harry H. Mitchell filed the update to the Articles of Incorporation to include the Post name change. Syde P. Deeb and his wife Angie R. Deeb were active Legion and Auxiliary members. On May 26, 1958, Syde and Angie deeded Lot 9 of Block “D” in the Anderson Heights subdivision as recorded on Page 50, Plat Book 2 of Leon County, Florida, to Sauls-Bridges Post No. 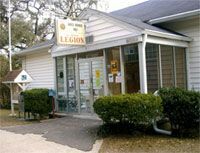 13, The American Legion. Now all the property around the north shore of Lake Ella belonged to Post 13. The deed is recorded on Page 493 of Deed Book 229 of Leon County. Syde and Angie also loaned the Post $7500 for improvements to the Post. In the 1950s the Veterans Lounge, which is now the Black Dog Café, was added to the structure. The Black Dog Café, a tenant business nestled in the southwest corner of the building, is a favorite gathering place for many Tallahassee citizens. Now the building houses a stage and a bar in the main hall, a meeting room for Unit 13 of the American Legion Auxiliary, men’s and women’s restrooms, a foyer, a kitchen and an administrative office for the Post. In 1980 the Post approached the city about selling the Post and property to the city. Nothing came of the inquiry. Building inspection in the late 1980s helped establish priorities for building improvements which were approved by the members of the Post and the Auxiliary. The Ladies Auxiliary room was added in the 1980s. A deck just outside the Veterans Lounge/Black Dog Café was built in the mid-1990s with materials donated by Lowe’s. A deck on the lake side of the main hall is the most recent addition. The recent revitalization of Lake Ella and the surrounding park by the City of Tallahassee has increased the walking traffic around the lake and has enhanced local awareness of the Post Home. Planned activities are scheduled at the Post throughout the week. The Tallahassee Swing Band plays for your dancing pleasure every Tuesday evening and at two benefits for the Post every year. Country Western dancing is taught on Wednesdays. A wide variety of bands and other organizations schedule activities at the Post Home for both public and private occasions. This history has been compiled from written records in the Post archives, records on file at Leon County and in the State Archives in the R. A. Gray Building.